The records tell us that Thomas Crawley learned the clockmaking craft under Richard Morgan, a member of the Blacksmiths' Company. Morgan was a Welshman from Flintshire and had been apprenticed in the Blacksmiths' Company in1612 to Robert Grinkin senior, one of the finest early watchmakers. Interestingly the Grinkin surname is a name from Germany and Latvia, and was apparently unknown in England until the arrival of this particular family and seems to have become extinct on the death of his son, Robert Grinkin junior. We must surmise that somehow they managed to overcome any barriers between a Welsh accent and a German one, for Richard Morgan was freed in 1621 and became one of the first Assistants in the Clockmakers' Company when it was formed in 1632. Richard Morgan was probably the earliest known British craftsman to have specialised as a spring maker for clocks and watches, and apparently was so deeply into spring making that he failed to give his apprentices the more rounded training they expected. In October 1655 he was ordered by the Clockmakers' Company to teach his apprentice, Davis Mell, one month at springmaking and two at watch making. The implication is that Mell was already working for Morgan and was dissatisfied. Perhaps Davis Mell had had enough of this shabby instruction and it looks as if he left Morgan's employ without waiting for any signs of improvement for at that same date he was made a free Brother. This was not the way a normal apprentice could behave, but then Mell was no ordinary apprentice. It may even have been that his instruction under Richard Morgan was merely a paper formality to allow the Company to officially grant him his freedom. This 'apprentice' is described in the Clockmakers' Company records as "Mr. Mell", an astonishing way to refer to a pupil, which is partly explained when we know that Davis Mell was fifty one years old at the time he took up clockmaking! How that arose will be explained later. There is no record of Mell being officially bound to Morgan, either as an apprentice or a journeyman. The first mention of his working for Morgan is in this 1655 note and it seems that it was a short-lived association. At the age of fifty one 'Mr.' Mell, a man from a genteel family and one famous in his own right as a musician, a man of considerable means, and one who mixed in Royal circles, did not have to put up with imperfect instruction. We do know from a comment made about him in 1658 that Davis Mell was 'a well-bred gentleman, and not given to excessive drinking" so it is unlikely he would have used uncivil language. But it is highly possible that Davis Mell's 'apprenticeship' under Richard Morgan was a very short one, or even merely a paper transaction. Just three months later, in January 1655/56, Richard Morgan was found guilty of the very same problem regarding another of his employees, Thomas Crawley, who was then already serving as an apprentice under Morgan, and was supposedly under the regulation of the Clockmakers' Company. Thomas Crawley might have been the child baptised on the 11th August 1639 at St. Nicholas Acons, London, the son of Thomas and Ann Crawley, which would make him the right age for subsequent events, but we cannot be certain of this. In March 1656 his father complained again of the same fault and Morgan was ordered to keep 'his servant' one month at springs and one at clock and watch making alternately, and it was decided he should stay with Morgan till a new master could be found to teach him clock and watch making. The term 'servant' was sometimes used to mean 'journeyman', but the term 'boy' and the complaint by his father, both suggest he was still an apprentice and under twenty one. There is no record of his being bound as an apprentice, either in the Clockmakers' Company or in the Blacksmiths' Company. But then Richard Morgan was a senior figure in both companies and such people seem to have utterly ignored the rules about binding apprentices when they felt so inclined. Oddly enough the only clockmakers of those trained by Morgan who did actually produce clocks were these two, Mell and Crawley, and they left his service as soon as they could. His other apprentices became specialist spring makers and I cannot help but wonder were they too given instruction directed only towards springmaking. It seems that Richard Morgan did not make clocks. We can deduce from what we learn later that Mell wanted to become a maker of, or dealer in, clocks, not springs. Thomas Crawley was transferred from Richard Morgan to Davis Mell, who had been a free Brother since October 1655. Thomas would have known Davis Mell from the latter's brief spell with Morgan, and must have seen in him a very different type of man from the impression we get of the Welsh tyrant. We do not know at what date the transfer of Thomas Crawley to Davis Mell took place, but we do not hear of Richard Morgan again after March 1656, so we might guess that Thomas Crawley worked as an apprentice for Davis Mell from about March 1656 until his freedom was granted in October 1660. During this period we know Davis Mell lived in Crutched Friars, which was in the parish of St. Olave Hart Street and next to that of St. Katherine by the Tower. One may wonder how Crawley could become an apprentice clockmaker under Davis Mell, when the latter's experience at clockmaking was virtually nil. Was this another paper formality by which Mell acquired the services of a local part-trained clockmaker he already knew? To Davis Mell clockmaking was only a secondary occupation. For most of his lifetime he was a professional musician. He was born in 1604 at Wilton near Salisbury, the son of a gentleman, and became a celebrated violinist and a member of the "King's Musick", a member of the musicians troupe accompanying the funeral procession of James I, then musician and bandmaster under Charles I, under whom he received various grants till 1644. He then became one of Oliver Cromwell's household musicians, and ultimately followed Cromwell's body during his funeral procession in 1658. In 1651 he was listed as one of the most able music teachers in London and also gave recitals. In 1657 he was described as "hitherto the best for the violin in England". It is recorded that Lodewijck Huygens heard Davis Mell play the violin in March 1652 at Mell's house. We know that at that date Mell lived in Crutched Friars, quite near to the Tower. Again on the 25th March 1657/58 Lodewijck Huygens recorded "We went on (from the Tower) to our destination, that is, Mr. Mell's, in order to hear some music performed." Lodewijck was the son of Constantijn Huygens and brother of Christian Huygens, the man who applied the pendulum to clockwork in 1657 and had shared his secret with Ahasuerus Fromanteel by 1658, in which year the latter had already introduced the pendulum clock into England. Fromanteel himself was an active financial supporter of Cromwell, who not only employed Davis Mell but also had interceded in person on Fromanteel's behalf in January 1655/56 to force through his City Freedom against the hostility of the Clockmakers' Company. The Company had always regarded Fromanteel and his son-in-law, Thomas Loomes, as the troublemakers they admittedly were towards the largely corrupt administration. In March 1657/58, when Lodewijck Huygens visited Mell's house, John Fromanteel, son of Ahasuerus Fromanteel, was actually in Holland working for Salomon Coster, Christian Huygens's clockmaker. Already by 1652/58 we have a link between Mell and Fromanteel, even if an indirect one, in that they mixed in the same circles and kept the same company. And the family of Huygens, the "inventor" of the pendulum clock, even visited Mell's house - and at a time when Mell himself was "making" clocks as a free Clockmaker! They must all have been known to each other Mell, Fromanteel and Huygens, socially and probably also commercially. Cromwell's Puritan and joyless administration shunned music as frivolous, decadent, even "promiscuous" and sinful, to the point where they banned hymn singing in church, and this attitude no doubt brought about a serious fall in the general demand for musicians. But "His Highness the Lord Protector" Cromwell personally took a great pleasure in music and apparently regarded himself as outside the sphere of common humanity by employing his own 'household musicians', just as Charles I had done and as Charles II would do later. Nevertheless the low demand was probably what led Davis Mell to seek an alternative and additional form of income from clockmaking during the Commonwealth period. In 1655 he joined the Clockmakers Co. as a Brother at the age of 51 and last attended in 1660, so that his connection with the Company lasted no more than five years. It was in 1660 that Charles II was restored as king and Mell again became a Royal Musician at a salary of £110 a year. So his need for an alternative income from clocks seems to have begun in 1655 and ended in 1660. In 1661 he directed the royal band of violins and jointly with George Hudson became Charles's first ' Master of the Music'. He was paid for work for the King in March 1662, but died on the 27th April 1662 at Poplar, Stepney. His will was proved on the 26th May 1662, describing him as a gentleman of Stepney. In August 1663 monies still owed to him by the Crown were paid to his surviving daughters, Abigail and Elizabeth Mell. Back in 1635 Mell had been married at St. Katherine's by the Tower to Alice Comey. Following the death in 1647 of Anthony Comey, Davis Mell's father in law, disputes about property ran on for years between the various Comey children and their spouses. One Richard Comey, identity unknown but perhaps Anthony's disgruntled son, evidently challenged the right to inherit of Anthony's daughters - Alice and her husband Davis Mell, Dorothy and her husband Henry Harfleet of Ash in Kent, Priscilla Comer, a spinster, and Ursula and her husband John Allen of St. Martin in the Fields, gentleman, which latter couple by 1653 had the Greenwich property. One by one they died off but even as late as 1694 Davis's daughters, Elizabeth Mell and Abigail (by then married as Abigail Dawson), still had the former Comey property in Greenwich. Davis Mell's spell as a clockmaker must have been limited to the period between October 1655 and 1660 or at the very most between 1655 and 1662. It is not surprising that very few clocks are known, which bear his name, five in fact and they include three which play on multiple bells - and several watches. I do not propose to go into the details of his clocks here, except in so far as they concern Thomas Crawley. I can say very briefly that two are relatively conventional lantern clocks, originally made with balance wheel control, one of standard size and one a miniature. Two other lantern clocks are two-handed quarter-striking clocks, again both originally balance wheel controlled. It seems very unlikely that Davis Mell really learned to make clocks based on this apparently very short time spent with springmaker Richard Morgan. Did he merely want the right to sell clocks to his musical friends and therefore appear to go through the motions of a paper training with Morgan? Could it even have been Mell who put Thomas Crawley up to complaining about Morgan only three months after his own successful complaints? Was it through Mell's intervention as a mature man of means and education that Crawley escaped the drudgery of springmaking (which, as we see below, he may have endured for three years already) to enter the grander world of clockmaking under Davis Mell? We can only guess what intrigue or machinations lay behind the very sparse notes recorded by the Clockmakers' Company, whose archives were always economical with the truth where there might have been a danger of ruffling the feathers of senior members of the administration. At least three of Mell's clocks imply a skill vastly beyond any he could have acquired under a brief spell with Richard Morgan. And why would he have chosen Morgan to train him, a man who was a springmaker, by whom no clocks at all are recorded and only a single watch? Was it because professional clockmakers were unwilling to take on a fifty-odd-year-old gentleman 'apprentice' from courtly circles with the delicate fingers of a violinist to purport to learn hammering and filing in a metal workshop? The more I think about this, the more unlikely this training seems to be. Mell must have paid Morgan a 'premium', as all 'apprentices' did, but there is no documentation of it in the records of either company. This probably means it was an illicit arrangement, a payment on the side, and it could well be the Clockmakers' Company were pleased to resolve this awkward situation by giving Mell his freedom to trade rather than risk the publicity of a scandal involving the under-the-counter dealings of Morgan, a man who was one of their most senior Assistants, and a man already twice admonished for irregularity of work practices. The solution appears to be that Mell bought his clocks from others to re-sell and that seems to make much more sense. At least he would have had contacts close to Royal and aristocratic circles from which to find clients for his clocks and those clocks of a musical nature would appeal to those contacts familiar with, and enchanted by, his musical talents. Who better to buy a musical clock from than the most famous violinist in the land? In fact when we look at Mell's supposed working period as a clockmaker, he was working on his own for only six months, from October 1655 until March 1656, when Thomas Crawley became his workman. This means that virtually all his clockmaking was done when Crawley's assistance was available and it is not beyond belief to suppose that it was Crawley not Mell, who did any clockmaking or clock assembling. Neither Mell nor Crawley could possibly have devised the exceptionally complex clock described below, which bears both their names - though Crawley could quite likely have 'finished' its parts, assembled it and fine-tuned it. The fifth and by far the finest of Mell's clocks, is a carillon chamber clock with automated figures (including one playing appropriately enough a violin and one a lute) having quarter chimes and playing every three hours on ten bells and twenty hammers a choice of two melodies, which may even be Mell's own compositions. This clock is of quite exceptional quality and mechanical ingenuity and has an original and extraordinarily early pivoted pendulum. Pins beneath the carousel gallery spin passing figures, flutter pennants, and move other 'conceits' as yet unidentified. These and other considerations have led to the suggestion that this clock was made by Ahasuerus Fromanteel, and we know Mell mixed in some of the same company as Fromanteel. This masterpiece could hardly be the work of a gentleman violinist who spent a few days with a springmaker nor of his newly-qualified assistant, Thomas Crawley. In addition to bearing the name of Davis Mell this exceptional and unique clock is signed on the base on a separately-attached plate - 'Thomas Crawley'. A clock signed with a second name out front is exceptionally unusual. Why would this be? Did Mell give Crawley credit for helping him in this work - and if so, why, as that is what journeymen normally did every day of their lives? Could it be that its 'making' was largely overseen by Crawley at a time when Mell was again busily involved in music, or when Mell was seriously ill towards the end of his life - and was this Mell's way of thanking him? The clock must date between 1658 and 1662, though after his re-appointment in June 1660 he may have had little time for clockmaking. It might even have been made to commemorate his appointment in 1661 as Master of the Royal Music. The fact that Crawley's name was unlikely to be added if he was still an apprentice (I can think of no example of this) would imply the clock was made after Crawley's freedom in October 1660. Davis Mell had one other apprentice, Cornelius Harbert, taken on in April 1659 and passed over to William Grout in February 1660/61, a time when Mell was once more occupied with his music. Harbert was presumably passed over because Mell wished to reduce his workforce, as he might well if returning to his musical career. This means that Mell's workforce from that date was a one-man-band consisting only of Thomas Crawley. Did Crawley complete the clock or perhaps handle its sale after Mell's death or during his illness immediately prior to that? Further reflection might suggest the clock would date after October 1660 and before Mell's death in April 1662. It may be pertinent that the other four clocks (and the watches) known by Mell are signed with his name only, unaccompanied by Thomas Crawley's name. In fact this carillon clock too was signed just by Davis Mell - with Crawley's name added as an afterthought on a separate plate, obviously after the main dial sheet was already engraved and finished. If all the clocks were made during Crawley's time with Mell, why should just this one clock carry Crawley's name too, and that clearly put on as a last-minute addition? Could it be that the clock was incomplete or unsold when Mell died? Could it be that Thomas Crawley added his own name then, perhaps with the consent of Mell's daughters? Could it be that the clock could only be sold by a living freeman? If so that would date it more accurately to the year 1662. We will never know the answer but the questions are intriguing. To summarise Davis Mell's movements briefly, he was married at St. Katherine's on the 30th April 1635 to Alice Comey. He and his wife then appear to have gone to live in the parish of St. Alphage, Greenwich, where his wife's parents, Anthony and Abigail Comey, lived and they probably lived with them. Children were baptised there to Davis and Abigail Mell: 1st February 1635/36 Dorothy, 27th December 1637 Richard (who died 14th April 1641), 21st October 1641 Elizabeth. Then sometime between October 1641 and the beginning of 1649 they moved to live in the parish of St. Olave's Hart Street (living in Crutched Friars?). There is a gap from late 1641 to early 1649. In 1647 he is described as of the parish of St. Martin's in the Fields, yet in 1653 as of 'London'. It may have been during that period that two other daughters were born, who were to survive their parents, Elizabeth and Abigail. Westminster is where Thomas Crawley worked in 1662. Perhaps Mell moved from St. Martin's about 1647-1649, as by the start of which latter year we know he was in the parish of St. Olave's Hart Street in Crutched Friars. In the new parish of St. Olave's Davis Mell and his wife Alice had further children baptised: 17th March 1648/49 Davis, 14th February 1653/54 Jacob (died 26th February), 16th August 1654 Edward (died 3rd September), 28th January 1656/57 Jacob (died 5th February 1656/57). In that parish his wife, Alice, was buried on 2nd August 1658. In John Aubrey's 'Miscellanies ' is mentioned a child of Davis Mell, who was cured of a crooked back by the touch of a dead hand. Which child, and which hand we do not know. Thomas Crawley appears to have continued to work for Mell for a while after his freedom in October 1660. It was customary for a newly-qualified clockmaker to work for his master for a year or two after his freedom. Davis Mell died on the 27th April 1662 and we know from a survey of clockmakers taken by the Clockmakers' Company in June 1662 that Thomas Crawley was working in Westminster, presumably on his own account. We can suppose that Thomas Crawley lived with Davis Mell and his family from about March 1656 till at least October 1660, or perhaps till Mell died on the 27th April 1662. During his time in the Mell household Thomas Crawley saw his share of family tragedy - an infant child of his master only a few days old was buried in February 1656/57, and the funeral of his master's wife, Alice, took place in August 1658. Oliver Cromwell's funeral followed in September. In October Ahasuerus Fromanteel first advertised his clocks for sale with the new pendulum, "the first that were in England", that "keep equaller time than any now made without this Regulator, examined and proved before his Highness the Lord Protector" - the Protector who was barely cold in his grave. If we assume the Clockmakers' Company list set out clockmakers in sequence of location, as seems to be the case, then in June 1662 Thomas Crawley's closest neighbours in Westminster were William Speakman on the one side, himself a freeman for less than a year, and John Smith in Ram Alley on the other, one of several of that name, which means we cannot identify him. Did he work for Speakman or Smith in 1662, or for himself? The fact that he seems to have spent only four years under Morgan and/or Mell, instead of the normal seven years of apprenticeship, would suggest that when we first hear of him in January 1655/56 he was older than a normal apprentice. We do know that at that date he was partway through his (unrecorded) apprenticeship and perhaps he had already spent three years under Richard Morgan. If we guess his age as at least twenty one in 1660, this being the usual age of freedom, then we would expect him to have been born about 1639 or before and to have been apprenticed about 1653. One Thomas Crawley married on the 20th October 1662 to Judith Baker at St. Botolph's Bishopsgate. A young man ending his apprenticeship was often keen to marry as soon as he could afford to and this date might fit in nicely with the end of his training. But another possible marriage for him was to Abigail Bond at St. Katherine by the Tower (Mell's parish of marriage) in 1657, before his freedom but the right location. He may have been the son of John Crawley of that parish. He paid his quarterage till about 1680 but was not documented in Company records after that. One of this name was buried in 1680 at St. James's Clerkenwell, and I think this was him. Feb 1975 Clean By ?? F. W. Cox? This clock is very unusual in having the hammer spring set along to top plate, a feature scarcely ever met with in London lantern clocks (provincial examples come into a different category). This system is known on an unsigned London-made balance-wheel lantern clock of about 1630 with four acorns on the dial, a clock which I have written about before and one with Fromanteel associations (Clocks Magazine November 2006). The strikework on this (four acorns) clock is exceptionally unusual and is by far the earliest example I know of this in English (London) work, though I understand it was sometimes used on the European mainland. The only reason we can deduce for using this method, on this clock and the others mentioned below, is that it would permit night silencing on a countwheel clock by manually uncoupling the lower end of the vertical link arm. The point of this system is that it will permit silencing without the clock's coming out of sequence - which otherwise will happen if any other method of silencing is improvised. For a full explanation see my article in Clocks Magazine for November 2006. Thomas Crawley has used it here for the same reason, namely to enable the strikework to be uncoupled, thereby offering silencing at will without the countwheel coming out of sequence. 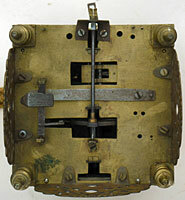 Crawley has improved the system by adding a small blade spring at one side, which holds the lever in position unless released manually, thereby preventing accidental uncoupling of the strikework. This method of top-plate striking was occasionally used after 1630 on lantern clocks by a handful of makers including Peter Closon in the 1650s, Ahasuerus Fromanteel in the 1650s-60s, his brother-in-law Andrew Prime in the 1660s-70s, Thomas Crawley on this present clock in the 1660s, Samuel Betts in the 1660s, as well as on at least one Fromanteel thirty-hour bracket clock and one unsigned hooded clock (possibly by Fromanteel). It was also used on some much later examples, which are hardly relevant here - on a musical posted-movement, countwheel-controlled, eight-day longcase clock of the 1690s by Ambrose Hawkins of Exeter and on lantern clocks by Joseph Knibb and by Jasper Lugg of Gloucester. Of those made before the 1670s almost all were by Ahasuerus Fromanteel or his family. This top-plate striking system seems to have been used otherwise only on musical and quarter-chiming lantern clocks, where internal space was at a premium. Lantern clocks with quarter chiming are in a rather different category, as it is possible that this system of roof-top hammers was preferred for quarter-chiming clocks (by makers who already knew of its existence) because of the lack of space for normal hammers. An example of this is known in a Peter Closon quarter-chiming lantern clock of the 1650s. But that is not the case here, where Thomas Crawley has used the top-plate striking to give a night-silencing option. Does this suggest a further link with the Fromanteel camp between Thomas Crawley and of course his master, Davis Mell? FOOTNOTE: The author would like to thank Keith Piggott for assistance in documenting Davis Mell's biography and extant clocks, including the great musical automaton chamber clock which he handled in 1974, and has placed in Ahasuerus Fromanteel's earliest pendulum oeuvre, ("The Coster-Fromanteel Contract, its continued place in modern scholarship" - Horological Foundation website). A longer version of this article is published in Clocks Magazine.